A new report says that biopharma firms are on the lookout for people with ‘soft skills’. BIG PHARMACEUTICAL FIRMS are on the hunt for graduates that have ‘soft skills’ such as teamwork and problem solving, according to a new report. The report was carried out by the Expert Group on Future Skills Needs (EGFSN), a group set up to advise the government on labour market issues. 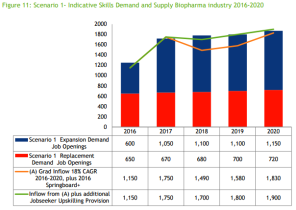 It estimated that there could be as many as 8,400 job openings over the next five years in the Irish biopharma industry due to a mix of retirements, people leaving the sector and companies looking to ramp up hiring. However, the group found that there needs to be several changes enacted to help Irish graduates secure jobs with these businesses, including “improving the alignment of education and skills provision with the needs of the biopharma industry”. It said that companies cite a lack of ‘soft skills’ among graduates. Soft skills are personal attributes that help people to interact effectively in the workplace, such as leadership, working in teams and communications. “It was felt by industry stakeholders that the quality of graduates is variable, especially with respect to interpersonal skills,” the report said. It added: “The ‘cultural fit’ of an individual within an organisation is also important. In many cases this revolves around the ‘soft skills’ competences that companies are looking for such as showing initiative, taking responsibility (and) communication skills. The report also said that work placements in biopharma companies should typically run for between six and nine months. “Companies consider that a three-month placement is too short for them and that the student only becomes useful after six months’ work experience,” it said. “It was concluded that structured placements should be at least 6–9 months duration. Jobs Minister Minister Mitchell O’Connor noted that the biopharma sector “employs over 28,000 people and creates significant secondary employment in construction and other services when investment in new plants is under way”. Other recommendations made in the report include a suggestion that companies expand their graduate-entry development programmes and the possibility for the government to develop a new biopharma apprenticeship and career traineeship for those on jobseeker’s courses.